You can do this project without the Cricut. You can make your pattern with a stencil and Exacto knife. But I used my Cricut because it just makes it easier and looks better. I think you could also just buy precut stickers and use those too. If you do scrapbooking you might already have some on hand. Clean your glass jar and lid, and make sure it’s dry. Make sure also that you have the label and all adhesive off. Decide on your pattern. 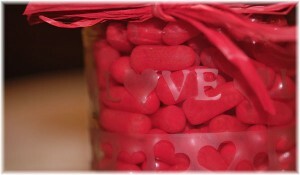 I decided to use the word LOVE and use a heart for the “O”. Not all that unique, but I was trying to come up with something simple and quick since I hadn’t tried etching before. If it didn’t work I didn’t want a lot of time and effort into something I was going to throw away! 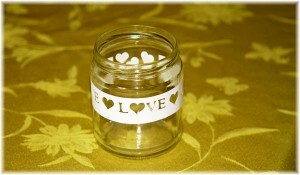 I simply cut out my pattern enough times go go around my jar once. It left some extra room so I cut out some extra hearts and filled in with those. I made sure to outline with the vinyl so that I would have straight lines where the etching ended. 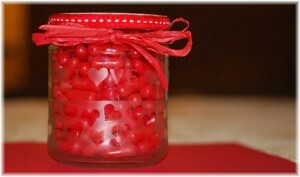 Then I filled in with more hearts on the rest of the jar, just because I wasn’t very creative. I made sure to have a straight line across the top and bottom, so that when I was painting the etching cream on, the edges would be even. 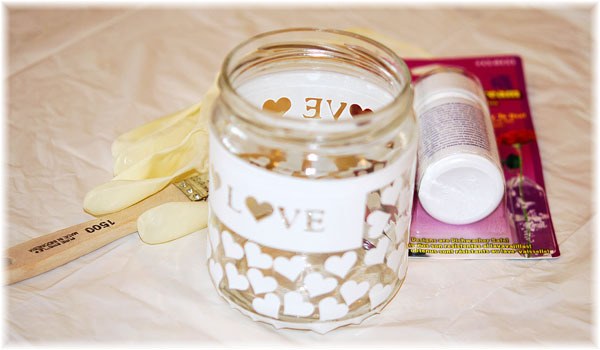 Once you have finished sticking the vinyl on the jar, be sure you press it down well and press out any bubbles. I was not as careful as I should have been and I had a few spots where the etching cream got underneath the pattern. This is not what you want, as it will then etch the glass underneath. A little bit may not be a big deal, but it means it won’t be perfect. So, take care when you are preparing and avoid that. Wear gloves for this next step, as the etching cream can burn your skin. Use a paint brush and apply a thick layer of the etching cream on the glass. Remember that where ever you get the cream will be etched, so if there are uncovered parts of your glass that you do not want etched, do NOT get the cream on them. In addition, something I read said it would also etch porcelain sinks. I thought I would be safe and keep it off my counter tops and all of my sinks. I did my work on a large plastic trash bag (which I threw out afterwards) and rinsed it off outside. Yes, this is how much I don’t like dealing with chemicals! At first, I was disappointed. It didn’t look like it had done anything. But when I started peeling the vinyl off, I was pleasantly surprised! My glass was etched! It looked pretty good! And it was pretty easy. I brought the jar in and washed it well with dish detergent, made a lid (see my Shell Keeper, I did a similar lid, except I put paper hearts on top) and filled it with Red Hot Tamales. Now, it’s a cute little Valentine gift! Cost almost nothing for the jar (the candy is another story). One day, i hope soon 🙂 i will buy a machine who call “bigshot”, cant’ wait !!!!!!! I love it. Yogi thinks I should Etch his name and dog treats on the jar I keep in my office. Hmmmmm! I actually thought about doing a doggie treat jar, but I didn’t have a dog bone image on my Cricut. I bet you could find a stencil. Or stickers. Or just do the words. I’m with Yogi. And then do a photo and I will post it! Fabulous project – love the fact that it recycles a pre-used jar. Thanks for stopping by, the Handmade Monday thing was such a cool idea, I’m glad I stumbled onto it! I plan to come back. 🙂 I used it for my Share It today. I am just getting started with my blog, as you can probably tell. Your blog looks pretty much “together” for something that is new – it looks amazing! Just found your “share it” – fab – and thanks! Would love for you to pop back next week, Handmade Monday seems to have generated a fair bit of interest already! What a lovely idea! I have to try this. I am not lucky enough to have either a bigshot or a cricut, but that doesn’t mean stencils and freehand won’t be just a cool. Yay. Thanks for a cool project. I love using the Cricut, mainly because I am not good at hand cutting, but but stencils would would wonderfully, I’m sure. I had been wanting to try doing etching, and I had everything on hand already, which to me is what makes a perfect project. 😉 Thank you for stopping by! That is really cute, what a great gift that would make!!! That turned out really cute! I got some etching cream and am just starting to experiment with it. love that etching! and such a lovely modern design! really decorative stuff! 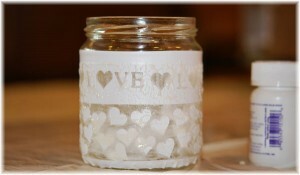 would love to see more of your glass jars!